A test call helps your video calls go more smoothly. You quickly check features and settings, so your live calls are easier. 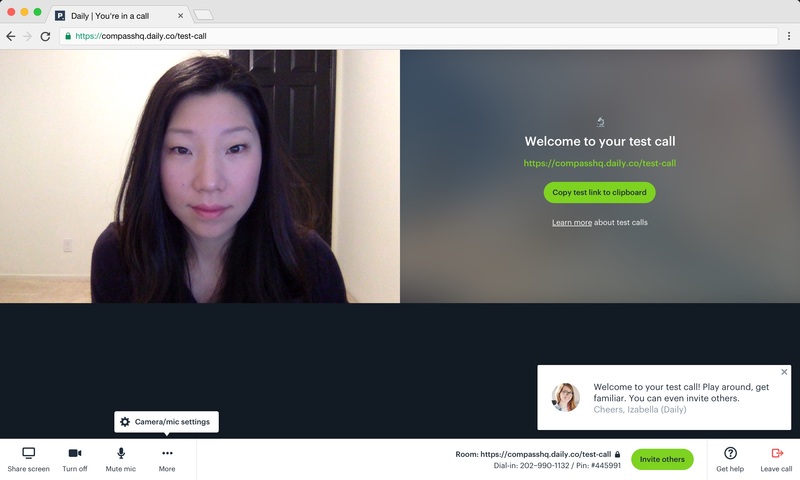 Example of a test video call. A test call you're also in a real Daily.co meeting. This means that you can do everything you'd be able to do in a normal video call. You can invite others to the call, screen share, mute your camera/microphone and even, change your camera, mic or speaker settings. Your test call link (i.e. yourname.daily.co/test-call) will be shown under "My rooms" in your dashboard. If you delete your test call link, you can recreate it by making a new room named "test-call".